Jeff: After several years of re-releasing the Nike Zoom Air Wildhorse 4 in new colorways, Nike has finally given it an update and is releasing the Wildhorse 5 on April 1. While Nike opted to completely change every aspect of its more popular and sleeker sibling Terra Kiger, the Wildhorse 5 update is largely an upper overhaul. 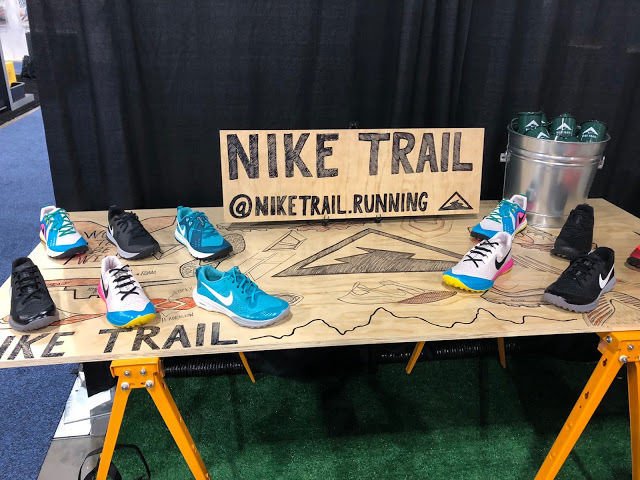 The Wildhorse continues to be a force on the trail, combining Phylon EVA foam, an Air Zoom unit in the heel,and a rockplate in the forefoot with a rubber outsole, and the result is a very smooth running trail shoe that keep the foot well protected over a number of very rocky miles. The all new upper helps shave noticeable weight off of the shoe, and makes a great running trail cruiser even better. Pink/purple/baby blue/yellow/green/white color way may have a limited audience (namely my five-year-old daughter), and gets very dirty quickly. Jeff: It’s the elephant in the room, and let’s just get it out there. This shoe’s looks are very polarizing. I’m not one to care that much about a shoe’s aesthetics, especially to bicker over colorways, but this one is really out there. I can’t knock it too hard though, because there are two other more traditional colorways (black on white and red on red) so if you aren’t a fan of pink, purple, and baby blue on your white trail shoes, then you have options. That said, if those colors are your jam, then you are in luck. My daughter literally grabbed my pair, hugged them, and ran upstairs screaming “I want to keep these forever!” No other pair of shoes I’ve tested has warranted even close to that response. All that said, in many ways the 5 is a return to normal. The Wildhorse 4 upper went some interesting places with asymmetrical lacing and a midfoot stretchy band that was supposed to lock your foot down. Personally, I had zero issues with it, but I know folks with narrow feet could have some problems, and the more traditional upper of the 5 should curb those issues. In the 4 I wore a size 11, but in the 5 I have a true to size 10.5 - and surprisingly, the smaller size still works well, providing a full thumb’s width from the end of my big to the end of the shoe. Most Nikes I advocate adding a half size up, but I wouldn’t in the Wildhorse 5. Jeff: We have known for a few months that the upper is where most, if not all, of the changes to the Wildhorse 5 would show up, and it does not disappoint. The The upper is a very comfortable mesh that is much softer than its predecessor, and is largely covered with "skin overlays" that give the shoe additional structure and are also supposed to provide additional durability in high wear areas. While the 4 used a more coarse mesh with some rubber cladding around the midfoot that acted like armor, the 5’s overlays are far more plentiful but also less substantial in thickness. The toe bumper up front does infringe just a bit on the extraordinary toe box, but even with that the shoe still has lots of room for your toes to spread out. It is no Topo or Altra, but it is close enough unless you have legitimate Hobbit feet. The tongue is well-padded without being overly thick, and it is attached to the rest of the upper on both sides by a thin piece of material that almost creates a bootie for your foot to slip into. The result is a very comfortable shoe that looks and feels much softer than a trail crusher should. But, it still holds the foot well enough to take onto technical trails, provided it hasn’t rained recently. The upper is far more symmetrical than the 4, however, the overlays are much more built up on the lateral side. Where the 4 used rubber armor cladding to the 5’s thinner and more pliable overlays, the 5 does wrap the foot with a slight bias to the outside. That said, it is a subtle shift, compared to the 4, which was spaced somewhat awkwardly. Jeff: From what I can tell, there have been zero to minimal changes underneath the foot of the Wildhorse 5 from the 4. As a result, you’ve got a nicely cushioned shoe that is approaching the protection of a high stacked maximal shoe with none of the inherent instability. The rockplate under the forefoot does a terrific job of muting any rocks you land on, while the 20mm/28mm stack really puts the shoe in a good place for many runners to take the distance. It is a stiffer shoe for sure though, The midsole is primarily Nike’s Phylon, which is an EVA based foam, with a Zoom Air unit in the heel. As a midfoot striker, that language always put me off on the Wildhorse because I like a well cushioned forefoot, but the Wildhorse does not leave you wanting more up front. The midsole is soft without putting it into the sluggish territory. My most recent run was scouting out a technical trail I’ll be racing in another week at the Dam Good Run nearby Lake Pleasant, and there was a short section of downhill on the road. As my pace picked up the shoe might as well have disappeared and I realized that if I was going to do hill repeats on dirt, the Wildhorse 5 would likely be my top choice, and will almost certainly be on my feet come race day. Jeff: I have good news and bad news. Like the midsole, the outsole of the Wildhorse 5 has not changed in any meaningful way from the Wildhorse 4. We have sticky rubber in the center (pink) and high abrasion rubber (black around the edges) for durability. And that means that the shoe is a rockstar in dry dirt, and an actual liability when you encounter mud or rain. The tread is fine, but not what I would consider robust (especially compared to the recent Saucony Peregrine ISO), and it is definitely weighted toward front grip. The lugs on the back half of the shoe are much smaller, and most of them are pointed outward in an odd angle in a largely unusable pattern. I’d envision them coming into play if you were sliding down a muddy hill, but this is among the last shoes I’d recommend if a muddy hill is going to be a part of your run. Not to say that the Wildhorse is an exclusive to the American Southwest, but that definitely seems to be its natural home. Jeff: I can keep banging this drum all day long. The Wildhorse 5 rides very similarly to the Wildhorse 4, and that’s a great thing. While the Wildhorse 5 claimed weight is only about a half ounce lighter than the 4, my apples to apples/real world comparison had them closer to an ounce and a half difference, and as a result the even lighter weight 5 is just that much more fun to run in. The 4 ran smoothly despite its hefty 12+ ounce bulk in size 11, and the 5 is even smoother. The shoe has plenty of protection, so you don’t need to be that agile on technical trails, but if you are among the fleet footed agile trail runners, you’ll like the shoe too. It doesn’t have to be a bulldozer, it reminds me more of one of the super sporty SUVs out there. Call it the shoe version of the Audi SQ5. Jeff: With minor changes, the Wildhorse 5 got just a little bit better. The upper became more traditional and lighter weight, while the rest of the shoe stayed the same. It might be more accurate to think of this shoe as the Wildhorse 4.5, because there is a lot of shared DNA with the 4. It still has problems when it is wet outside, and that’s disappointing - a new rubber compound or different outsole design could have fixed that flaw, but underneath the foot nothing really changed. The lack of change can be a serious benefit to a number of runners, however. If the 4’s asymmetrical lacing and midfoot strap worked for you, then you can save yourself substantial coin and stock up on the old style. If you have a more narrow foot, if every ounce matters, or you have a serious hankering for a pink and purple shoe, then the 5 is right up your alley. Either way, it is a versatile trail shoe that shines on long runs, ideally in the rockiest parts of the desert, that way you avoid any wet and you play into the shoe’s strengths. The improved toe bumper is a nice addition, as is the softer and more comfortable upper. The 5 is a subtle improvement over the 4, but is largely the same shoe with a different look. Jeff: The 5 weighs a little less and has a more traditional upper, the 4 has just a little more room in the toebox due to the new toe bumper on the 5. Otherwise, they are very much the same shoe. 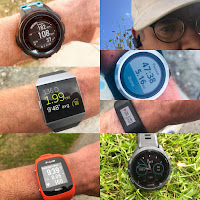 Narrow footed runners will likely find the 5 more accomodating fit-wise, but most runners will find the 4 just as good, and likely on a nice discount. Jeff: The weight loss of the Wildhorse 5 has it neck and neck with the Caldera 3 weight wise. Caldera 3 has a traction advantage, Wildhorse 5 has the foot protection/toe box advantage. Unless it’s raining, I’ll take the Wildhorse. Jeff: The Topo wins in the massive toebox contest, as well as traction (especially wet), but the Wildhorse’s firmer midsole and rockplate makes it better when the trail gets rocky, and it runs smoother as well. Unless it’s rainy, I’ll take the Wildhorse. Jeff: Peregrine has a mountain of traction in all conditions, and while it feels more uptempo it weighs nearly a half ounce more than the Wildhorse. The Peregrine has plenty underfoot to take it long distance, but the more technical the trail the brighter it shines. Anything wet, short, or super technical, take the Peregrine. Longer or smoother runs favor the Wildhorse. Jeff: Neck and neck in weight, the Challenger has a bit more stack, no rockplate, and better wet traction, the Wildhorse has more overall rock protection, a more secure upper, and better dry traction. The Hoka is more comfortable, the Nike is more stable. I’d draw the line at 20 miles, anything north of it take the Hoka, 19.9 or less, I’d go Nike. Can’t miss either way. Jeff: These two shoes line up very well across from each other. Nearly identical in weight, they play off of each other well. The EVO Mafate has more cushioning and a plusher ride, as well as better traction (especially when wet), and a more secure foothold via the upper. The Wildhorse 5 has a much roomier toe box, its upper is much more comfortable, and it costs $110 vs the $170 Hoka. So which should you choose? If you have narrow feet and can stomach the extra $60, the Hoka is the better performing shoe. If you have wide feet and don’t run much in wet or muddy conditions, save the cash and rock the Wildhorse. The product reviewed was provided at no cost. The opinions herein are entirely the author's. RoadTrailRun receives a commission for purchases at the stores below. I’ll pass by virtue of the colors alone. What was Nike thinking? You know they’ll come out with better color ways down the road. So disappointed in these colors. The white/blue/pink isn't my jam, but at least it's a unified, stylish look. The black and red versions are just generically ugly. And, yeah, complaining about colors is superficial, but the looks do matter. My Wildhorses are a go-to everyday sneaker as well as a trailrunner, especially when I'm traveling and can only pack one pair. Really wish I hadn't passed up some on-sale 4s in anticipation of these. Guess I'll just have to run my beat-down 4s into oblivion while hoping some new old stock pops up on Ebay. I think they dont care about trail runners. The fact they take 2 years to update a shoe with a new upper is crazy. Added a picture I took at the Running Event of the available colors for both Kiger 5 and Wildhorse 5. I loved the WH 3 but the 4 causes rubbing/pain at the ankle collar, especially if you tighten the laces or use the heal lockdown eyelets. Has the 5 improved in this area? Well, guess I'm more impressed with this update than I thought I'd be; >1oz savings is nothing to sneeze at. Still, I have 2 pair of the WH4 so will sit tight for the time being. Sizing I still have questions about since the review states 'toe bumper limits toe space' but also that he was able to downsize 1/2size. I wear a M13US now in WH4 and want to know if M12.5 is an option. Unknown - I'm 100% with you. I get it if they'd addressed the outsole and it didn't make things any better - but no attempt to improve? Total bummer. John - Personally I really like the red version, but I'm a red fan so that's not a huge surprise. You are right though, based on previous performance we'll probably see at least 8 other colorways released in the next year or so, eventually they'll make one you like. Anonymous - the black/white doesn't work for you as a more low key option? I get the Miami Vice homage not being your cup of tea (or most) but it's hard to go wrong with b/w, even if it seems kind of wrong on a trail shoe. Greg - Here's hoping the WH6 takes some risks. And comes out before 2022. Cary - I didn't need to use the extra eyelet to lock the shoe down (in either iteration) but looking closely at the two shoes, and they seem virtually identical on the inside of the heel collar. At the rear directly behind the pull tab, the 5 is slightly more scalloped out than the 4, but shape/material/thickness on the interior of the heel collar is virtually identical between the two. Sorry I can't help more. rms - The weight loss was a surprising bonus. The toe bumper in the 5 can be felt, but primarily when wiggling your toes (in other words, trying to feel it). At no point on any of the runs did I feel like the toe box was limiting in any way. As for the sizing, the 10.5 was all Nike had to send, so I figured I'd make it work. But, as soon as I tried them on I had zero issues. When I purchased my first pair of 4s from my local running store, I tried on the 10.5 and the 11, and it was night and day difference that the 11 was right. The 10.5 in the 4 was cramped, not just up front, but it didn't line up with the arch of my foot correctly. Just goes to show that shoe manufacturing/design isn't an exact science. That rounded heel with the awkward, useless lugs around the beveled surface made descents and landing on ones heels very tricky. I liked the 3 as a smooth cruiser, but when the going got technical, that rounded heel demanded perfect landings and led to too many ankle turns otherwise. Jeff thank you for trying to bring some clarity to the sizing. When you talk about the bumper, you're just referring to the volume from the top down at the toes? Does it create any kind of pressure or would you imagine it would after hours on the trail? I felt the difference in sizing between WH3 and WH4 was somewhat dramatic. I think my foots grown a bit in the last couple of years, but in an old WH3 10.5 (my original Nike sizing) my toes are crammed up front with no real room and in my WH4 there is not only closer to a full thumb, but I found the WH4 less secure in the midfoot/forefoot. Not terribly, but with my go-to thin socks and feet that don't fit narrow brands, I "rolled around" a little. I also never found the rubber armor comfortable or helpful and the lacing odd. Glad to hear the WH5 has fixed all that and that they sound like they have the fit and feel reminiscent of the WH3! But I'll be ordering a size 10.5 AND 11, just to be sure. You are very welcome, and I think you have the right idea. I really don't think the more built up toe bumper of the 5 will come into play unless sizing is way off. As I write this I've got the 5 on left and 4 on the right foot (my left is slightly larger), and when I wiggle my toes I can slightly feel the toe bumper on the 5 (and really only near the big toe, nothing near the small toe), and nothing on the 4. I'll be wearing the 5 this weekend for a fairly technical 26K, and I have zero worries on the toe bumper getting in the way in any manner. And for the record - the 4 on my smaller, right foot has a full thumbs width, and the 5 on my larger, let foot has 95% of a full thumbs width. My foot is wide/high volume enough I haven't had any midfoot grip complaints on the 4, but I can very easily see how that would come into play. The 5 is a huge step up in that regard, even though it isn't quite symmetrical it is close enough (and design is traditional enough) that you can really lock it down. As for ordering both, good call. So many retailers give free return shipping, giving both sizes a shot is the way to go. I hope that helps. If there's anything else I can elaborate on, let me know and I'm happy to help. Thank you! ALL shoe reviews should include all of this testing and details! I’ll likely still order both, but your guess is my V5 size will be the same as V4? And thankfully so far the WH and Kiger have stayed the same size. Is the wet grip on the wildhorse 5 the same as on the kiger 4? I love the kiger 4 (on my third pair) and I had no problems with grip on wet or mud. I would like to try the wildhorse for extra cushioning during ultras but I'm a bit worried about the comments about wet grip. Chris - you are very welcome, and thank you very much! Without more info it's hard to nail down sizing. I'm a big advocate of the phrase/philosophy "we are all an experiment of one" and in shoe sizing it's more evident than most thing. I consider myself a true to size 10.5, except in most Nike (and some Brooks) I wear an 11. By comparison my dad is a 9.5-10 in most brands, but he tried on my size 11 Epic Reacts and fell in love, and they fit him perfectly. I know other folks who sized down a half size in the Epic React and found they fit great. I'd honestly recommend you go with the same size in the 5 that you did the 4, but if you have the means to order two and return one, I'd do . When you have one size to try on you can talk yourself into it fitting well, even if it doesn't - but when you can make a comparison between two there's no mental gymnastics required to find the right one. Gijs - unfortunately I only ran in the Kiger 4 very briefly, and never in the wet. I know the Kiger 4 outsole design was very similar (if not identical) to the WH4/5 outsole, but am fairly certain it is a slightly different rubber compound. I haven't seen many other folks having wet problems with the Kiger 4 (at least not on the same level as the Wildhorse), so I'm guessing that the wet grip is better in the Kiger than the Wildhorse. Sorry, that probably was not what you wanted to hear, but you may want to look at the Kiger 5. 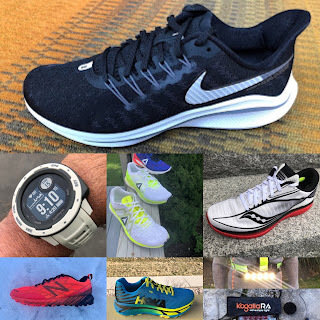 Based on what Sam has said so far, the update to the Kiger 5 is substantial, and may have more cushioning than the 4, so it could be an ultra option. Jeff: Explained EXACTLY right thanks! Always helps me to avoid buyers doubt by comparing. Any early indicator that the kiger 5 will be “longer distance” than the V4 or made for the sale range with WH5!still being their “ultra shoe”? Tbanks for reading and commenting. After further running and testing, I'd suggest going up the half size if you are planning on running very long technical trails. I raced a 26K today, and the shoes were great for the first 14 miles or so, but for the final few miles I would've killed for a little more room up front. Both big toes started blistering on the outside, as well as the small to on my right foot. I took the WH5 17 miles right out of the box, but that trail wasn't very technical. If you are keeping runs to a half marathon or less, go true to size, but for longer runs I'd go up the half size like most Nikes. Really does help thank you! I’m a 10 true to size in other brands, but have always been 10.5 in Nike and will likely still try the 10.5 and maybe the 11 based on your experience. Tried the WH4 next to the WH3 yesterday I still had around and the 3 seemed shorter...maybe the 5 went back to that size? If you are a true to size 10 and a nike 10.5, I wouldn't bother with the 11. I'd be surprised if 10.5 isn't perfect for you. Today was a sad day. My WH5s arrived and I was able to try on my normal size and 1/2 above. Jeff you were right, the 10.5 was the “perfect” fit. Maybe even a little more length than the WH5. But the overall fit was a major disappointment for me.i put on my thinnest socks to give myself the best shot, but the midfoot volume and width must have changed because the material felt like it was stretched at its limit with some odd creasing and the laces were hard to pull together. But the worst part was the toe box. I didn’t noticed the low toe cap as much as the VERY cramped and uncomfortable squeeze. I have a WH3 and WH4 to try side by side and the nice wide and accommodating forefoot of the past is gone. I’m not asking for Altra, just wanted WH! Sadly I’ll be sending them back. Uncomfortable in the living room means no good on the trail. Let’s hope the Kiger5s can handle the distance! I'm very sorry to hear that. Such a bummer that the midfoot was too tight for you, just goes to show how individualized all of our feet are. Also how just a millimeter here or there makes all the difference in the world. You are right though, if it doesn't work at home it'll be even worse on the trail. Good luck with the Kiger 5, I'm also very interested in giving it a shot myself. My 2 cents on sizing. WH4 vs WH5 size 11 - length and width seem about the same to me but the toe box is definitely tighter, less height and the lace is a bit closer to the toes. The WH4 had that asymmetrical lace and perhaps thats what helped the one issue I seem to have wit the WH5 which is the pinkie toe. I can definitely feel the overlay over the pinkie toe. It caused me some rubbing on a 20 mile run which was the second run I did in these. My hope is that the upper will soften up over the next few runs and wont cause further issues. I think some people will have problems with these. They still seem to have the width in the toe box (speaking as a narrow footed runner) but I am enjoying them more than the WH4 as my forefoot feels a lot more locked in and when you add in the lighter weight these shoes are a joy to run in.